The buffering action of amino acids such as alanine, CH3CH(NH2)COOH, is sometimes referred to in A level syllabuses. The nature of this action is not usually made clear, however, and is often confused with the fact that these compounds are amphiprotic, that is can accept or donate protons. CH3CH(N+H3)COOH that the buffering action can occur by the usual means, that is the pH is on the relatively flat portion of the curve. The amino-acid becomes a buffer once some acid has been added. A similar argument can be made for the addition of base; in this case the buffer mixture is CH3CH(NH2)COOH and CH3CH(NH2)COO - . 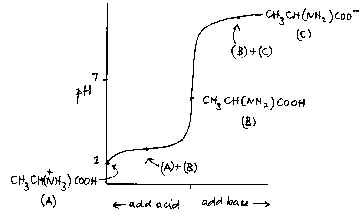 As with all buffer mixtures, there must be an acid and its conjugate base present for the buffering action to happen.